A one-day course for anyone going to sea, providing an understanding of how to use the safety equipment aboard your boat. Cruising is one of the safest leisure sporting activities, and 99.9% of those afloat will never use their life raft. However, if you are part of the unlucky 0.1% your chances of survival will be greatly increased if you understand how to use the equipment and how to help yourself. 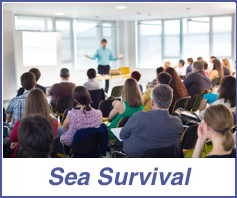 It is a well-proven fact that, in the event of an emergency at sea, people with training are more likely to survive. This course is a requirement for anyone wishing to add a Commercial Endorsement to their Yachtmaster Certificate of Competence. Price includes all tuition and Greek VAT at the appropriate rate.